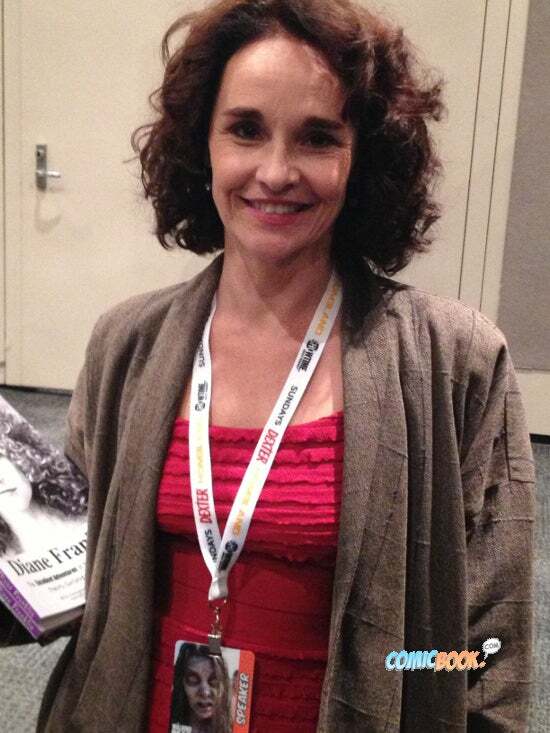 Diane Franklin, whose autobiography The Excellent Adventures of the Last American, French-Exchange Babe of the '80s was just released through Amazon, is one of the most iconic performers in '80s cinema. While never a headlining star, Franklin played the love interest to John Cusack and Keanu Reeves, in between work like The Last American Virgin and Amityville II: The Possession. In recent years, she's transitioned to behind-the-camera work, while fostering the show business aspirations of her children. Appearing at the New York Comic Con to promote her book, Franklin took some time out to talk to ComicBook.com about her past and her present, as well as whether her future might hold another go 'round with the Wyld Stallyns. So--you were in Bill & Ted's Excellent Adventure, but I can't remember seeing you in the second film. Were you in Bogus Journey or not? I was only in one Bill & Ted's Excellent Adventure, the first one, but I hear that they might be doing a sequel, I guess another movie, so I don't know if I would be included in that but I would love to--it would be fun. It doesn't seem entirely unlikely--I mean, William Sadler has already suggested there's a part for The Reaper. Oh, really? Oh, my gosh. It would be great--it would be fun if they brought back the original babes. From what I know. the guys wanted us to be brought back into the sequel in the first place, Bill and Ted's Bogus Journey, but I don't know if the director-producer wanted that. I always thought that they just wanted to keep the guys free and easy. After Back to the Future, it kind of became that if the girl is not the object of the film--if it's not like Better Off Dead where he's seeking her--they're kinda replaceable because nobody complained about Back to the Future. Yeah, exactly--in fact, actually it's funny you say that because Claudia Wells took that role and I just spoke to her recently. I guess something came up where Claudia couldn't do it, and that's why they replaced her, but again you're right. Certainly in Bill & Ted's, it's really about "the guys." And so we were "the babes." But it is interesting that I get recognized from that film--and just because it's such an iconic '80s movie. Alright, well, tell us what you're doing here at Comic Con, because you just came out with an autobiography. I certainly did--and it's called Diane Franklin: The Excellent Adventures of the Last American, French-Exchange Babe of the '80s...oof! Basically the idea is that I came out with this book just last month--it's on Amazon and Kindle, and it's not in the bookstores yet but that's my next step. I self-published--and the reason that I did that is because I wanted to control the rights and I wanted to make it the kind of book that I would want fans to have, and so you can go to your favorite movie--if you like Amityville II, you go to that, if you like TerrorVision, if you like Better Off Dead there's chapters you can go to--but the main thing is that it's a fun, upbeat book. It's got tons of pictures--it's so much fun, I've only gotten positive feedback from it. So I'm publicizing the book and I'm here to sign autographs at New York Comic Con, and also to tell people that I also am doing a radio show that is on CRAGG. I did one show that was so successful that I'm doing another one. It's the Halloween special and what I do is that I bring back all these '80s babes and we talk and reminisce. My first show is now on SoundCloud, and you'll be able to bring up the first show. My second show will be out on October 27 on CRAGG at 7 p.m. and if you want, you can also see me doing the interview on Stickam. And so I guess if you go to Stickam and you put in "Diane Franklin" or "CRAGG," you'll see me talking. When I'm calling all these different people from the films, everyone had such a different schedule that I'm basically on-air for like six hours [laughs]. We're sort of a marathon. What's really fun is that you know how after a while you get kind of punch--and so you'll see some more entertaining things toward the end. I do the paper plate dance...anyway! So basically my show's upbeat, it's got '80s music, it's got soundbytes from the films I've done, and other actors, so that's going on, too. So there's the book--you can go on Amazon and get it--and the cool thing is that if you friend me on Facebook, and you buy my book, I'll sign it for free--but only if you're my Facebook friend. And I just did a cover for a magazine called Celebrity Parent, which should be out in a couple of months. All the information, and everything that's going on with me, I let people know on Facebook or Twitter, as well. You've been doing a lot more behind-the-scenes stuff, too. I think the impression is that when you've got a beautiful young girl and she's suddenly not onscreen anymore, that she bowed out of the business, but you've been producing and things for a chunk of time now. Right--and of course I write about this in my book, what I'm doing in my life now and what I've done, but I wanted to have a family and raise my kids and be there for them. So now they're a little bit older--my son is 13, my daughter is 16, they're both amazing. My daughter is a filmmaker, and basically what happened was--Olivia started acting and she actually worked with Julie Andrews when she was seven years old in a thing called The Cat That Looked at a King. And--amazing! With the English accent, so you can imagine how excited I was: [Affecting an English accent] "Oh, Olivia, that was lovely! Where did you learn that accent?" And then she started learning filmmaking very young. We went and I showed her different aspects of writing and by the time she was 12, she actually had won her first award for a film, called The Adventures of Lass. And I of course, as her mom, will act in her stuff. So I acted in that movie, then she did a sequel to it, and these were fifteen-, twenty-minute movies. So we did Adventures of Lass 1, 2 and 3. Then she did a movie called Humanized when she was 14 or 15, and that just won--it was shown at the Los Angeles Film Festival this year and it played at the Los Angeles Film Festival. Most recently this summer, she just did a movie called My Better Half. You can see these trailers if you go onto YouTube. It's just My Better Half trailer, Humanized trailer. I do a voice in Humanized--the computer voice, so you don't see me, but in My Better Half, I play the evil, horrible, pushy mother you'd never want to have. And the great irony is that I almost didn't get cast in that part because my daughter said, "I'm not sure you can be mean enough." I'm like, "Olivia, wait, give me a chance!" Well, she's got a point--I've never seen you be...awful onscreen. Oh, well you should see Summer Girl, then. It was this great movie-of-the-week that I did in the '80s. Just fantastic, and I write about it in the book. It's really fun. So what we're doing is that she has this film, and actually her writing was so good in Humanized that a professional cinematographer offered her services to make her film, to shoot it to help her, and she did this My Better Half trailer so the movie looks incredible. So we're submitting it to Sundance and the Los Angeles Film Festival, the Los Angeles Comedy Fest. But Olivia writes comedies--and this is why, as a mom, I'm trying to give her the opportunity, the exposure and the time to develop it but also I want to let my fans know, "Look, there is this talent here"--and if she wasn't talented or capable of doing this, I would not do this. But she is amazing. As an actress, I think people are going to have fun seeing her, too, because she kind of looks like me and you'll see similarities sometimes. I want my fans to be in the know about her so that when she does come out with her first feature, people will go, "Okay, I know who this is," and they'll enjoy it. And of course, you're best known for your comic roles, so there's likely to be some crossover anyway between your fans and Olivia's. Yeah, they'll love these films. She's hysterical. One time, which was great, Savage Steve Holland was working on Big Time Rush and he let her be his shadow and walk through things. I told her, "Olivia, this is a gift." And when it was done she didn't want to leave. When it happened I guess she was about 15, but she had already won a couple of awards for the films she's done so he knew that she was professional in what she was doing. They were just talking about the shots. And he's just the greatest guy in the world--anyone who knows Better Off Dead knows that Steve is amazing. He treats everyone with respect; we had the best time on Better Off Dead, I can't say enough about Steve. And of course he wrote your introduction in the book. Oh, this is a great story. I thought--if I'm 97 and I'm looking back at this book, who would I want to do the foreword? And I'm thinking, do I want a journalist, do I want an actor? And I thought, "I want Steve. I want Savage. Savage is going to make me feel good." Because that was such a wonderful film for me and he believed in me to be able to do it. It was a big step for my career emotionally. So I called him up and I said, "Okay, Savage, I have a question. Would you mind doing a foreword? It doesn't have to be a lot, it could be like a sentence, but could you just give me something for a foreword?" He said, "Oh, I'd love to but I may not be able to get it back to you for two weeks because I'm working." I said fine, whatever, no rush. The next day, I get it--he says, "I couldn't wait to write it and I just stayed up all night and wrote this." And I read it, and it's like this love letter to Diane Franklin. It's the most amazing, wonderful thing he's shared with me and the fans, so I just want everybody to know that this is something...this book is made of love. Even my editor, his name is Michael Picarella--I was like, "Who do I want to edit this book?" If I get someone from a publishing company, they might be very critical of it and want to change a lot of things. That's not necessarily true, but then I thought about getting a student, somebody young and hip--but they may not have the time and they may not understand the genre. Then there is this guy who writes newspaper articles but he also edits, and he's a filmmaker and he happens to be obsessed with '80s movies. So he got me--he got it. I told him, "When you go through this book, please don't edit too much. Don't change the cadence. I wanted readers to feel that this is a primary source, that it's my words and you're sitting and talking to me for a few hours and I'm telling you all these tidbits. And he was wonderful--he was a great editor for me. It's more primary--and so it's great because it's not just fun for everybody to read but it's also somewhat historical. Somebody from college could use this book as reference for what it was like in the '80s. Because I published it, I was able to do that. It didn't have to go down the line of hearsay from so-and-so.